At White House, Netanyahu Calls '67 Border Lines 'Indefensible' : The Two-Way One day after President Obama said the U.S. wants those lines to be the basis for peace talks, the Israeli prime minister repeated his opposition. Obama said he still believes "it is possible to shape a deal." Israeli Prime Minister Benjamin Netanyahu and President Barack Obama in the Oval Office today (May 20, 2011). One day after President Obama said the U.S. wants Israel's pre-1967 war borders to be the basis for Israeli-Palestinian peace talks, Israeli Prime Minister Benjamin Netanyahu repeated his opposition to that position. Obama, meanwhile, said he still believes "it is possible to shape a deal." The two leaders met at the White House. Afterward, Obama said they had "prolonged and extremely useful talks," but also conceded that the U.S. and Israeli governments have some differences. 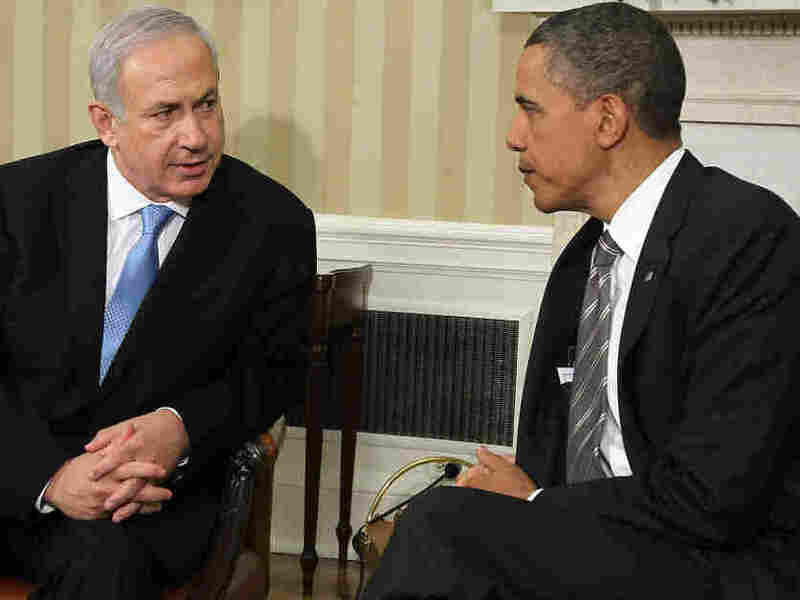 Still, he said he believes it's possible to shape a peace deal that will give Israel security. Netanyahu, though, said Israel cannot safely go back to those border lines and said it cannot negotiate with Hamas, which he called the Palestinian verison of al-Qaida. Update at 3:45 p.m. ET. -- Obama: "Obviously there are some differences between us in the precise formulations and language, and that's going to happen between friends. But what we are in complete accord about is that a true peace can only occur if the ultimate resolution allows Israel to defend itself against threats, and that Israel's security will remain paramount in U.S. evaluations of any prospective peace deal. "I said that yesterday in the speech, and I continue to believe it. And I think that it is possible for us to shape a deal that allows Israel to secure itself, not to be vulnerable, but also allows it to resolve what has obviously been a wrenching issue for both peoples for decades now. "I also pointed out, as I said in the speech yesterday, that it is very difficult for Israel to be expected to negotiate in a serious way with a party that refuses to acknowledge its right to exist. And so for that reason I think the Palestinians are going to have to answer some very difficult questions about this agreement that's been made between Fatah and Hamas." -- Netanyahu: "I think for there to be peace, the Palestinians will have to accept some basic realities. The first is that while Israel is prepared to make generous compromises for peace, it cannot go back to the 1967 lines — because these lines are indefensible; because they don't take into account certain changes that have taken place on the ground, demographic changes that have taken place over the last 44 years. "Remember that, before 1967, Israel was all of nine miles wide. It was half the width of the Washington Beltway. And these were not the boundaries of peace; they were the boundaries of repeated wars, because the attack on Israel was so attractive. "So we can't go back to those indefensible lines, and we're going to have to have a long-term military presence along the Jordan. I discussed this with the President and I think that we understand that Israel has certain security requirements that will have to come into place in any deal that we make. "The second is — echoes something the President just said, and that is that Israel cannot negotiate with a Palestinian government that is backed by Hamas. Hamas, as the President said, is a terrorist organization committed to Israel's destruction. It's fired thousands of rockets on our cities, on our children. It's recently fired an anti-tank rocket at a yellow school bus, killing a 16-year-old boy. And Hamas has just attacked you, Mr. President, and the United States for ridding the world of bin Laden. "So Israel obviously cannot be asked to negotiate with a government that is backed by the Palestinian version of al-Qaida."